Hold on a minute, is this a wargame? And a solitaire game? I thought Opinionated Gamers was about multiplayer eurogames! What is this blasphemy? Yes, Navajo Wars is a wargame, though it’s not your typical wargame. While it does have conflict, there’s much more to it than that. I’d say if you’re a eurogamer and you’re looking for something different, a game that’s more challenging than standard euro fare, a game that’s steeped in history, and a game that you can play whenever you want without having to scare up an opponent, you might want to hear about Navajo Wars. The game was designed by Joel Toppen and published by GMT Games, today’s preeminent wargame publisher. 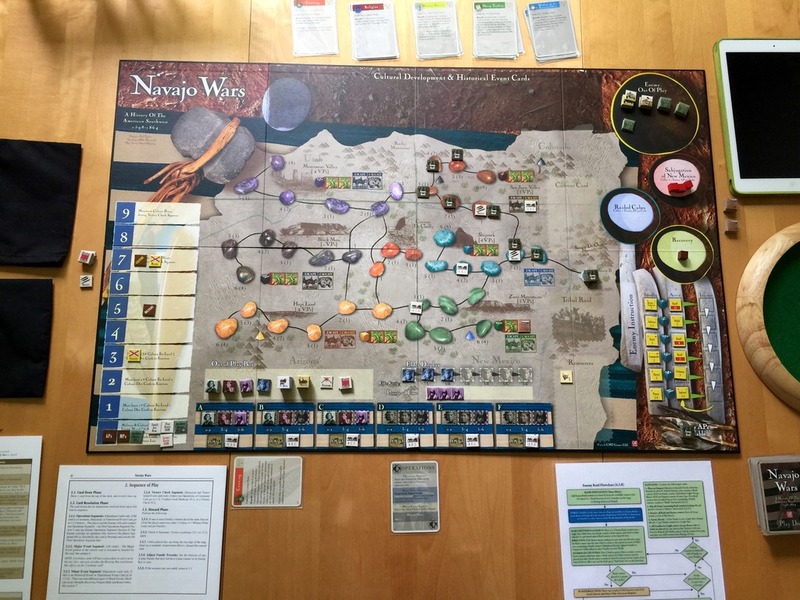 Toppen chose a very interesting and underserved topic for the game, the history of the Native American Navajo tribe in the southwestern United States. 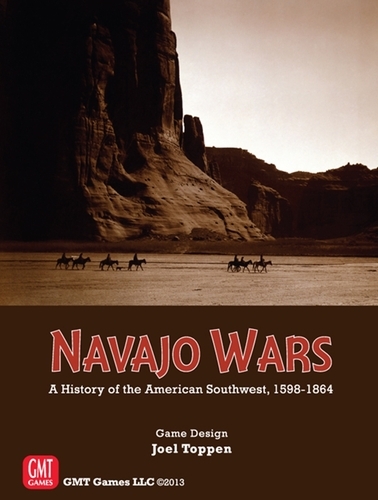 The scope of the game spans over two hundred and fifty years, from 1598 to 1864, as the Navajo fought to retain their independence from the Spanish, then the Mexicans, and finally the Americans. Author’s Note: For the rest of this review, except in reference to the name of the game, I’ll be referring to the Navajo people as the Diné (pronounced “dih-nay”), their preferred name. Component-wise, the game fares pretty well. The board is mounted, a luxury considering most wargame boards are paper. It depicts the southwestern United States as series of interconnected areas and is illustrated in a very unique Native American style. The counters are fairly typical die-cut wargame counters – a step down from euro quality, but still fine. The cards are of decent quality. All the other components are of good enough quality. So what about the rules? Well, this is where some eurogamers might balk. There are about sixteen pages of them, densely written, and though they are fairly well done, they are not easy. In the eurogaming world, they would be considered complex (though they would be of only medium complexity in the wargame world). Also, the rules are fiddly in the extreme (if you’re not aware, this is common for wargames). There are tons of little rules and procedures that make things very difficult to memorize. Fortunately, the game includes a number of player aids to help you along. To aid in learning the game, it also includes a very good tutorial. After playing the tutorial and reading the rules, my first game took a long time, maybe three hours, as I endlessly looked up rules and procedures. The playing time decreased dramatically for my second and subsequent games to the point where I’ve got it down to between sixty and ninety minutes (that’s for the shortest scenario – there are six scenarios altogether that range from about ninety minutes to many hours). After my fourth game, I had most of the rules down and only had to look up particularly long procedures. So, how does it play, you ask? Well, the player controls a number of Diné families on the board (extended families, really) with each family represented by a counter. The families can perform actions such as moving around the map, planting or harvesting corn, raiding New Mexico for supplies such as horses or sheep, raiding enemy outposts or forts to drive them out of Diné areas, and other actions. There are other operations that allow you to grow your population, use elders for special actions, add new families, etc. This being solitaire, the enemy is controlled by the game. They can build outposts or forts, raid the Diné, declare peace (for a short time), colonize the tribe’s land, or use various other methods to subjugate the Diné. The way the enemy works is incredibly inventive and easily the highlight of the game. 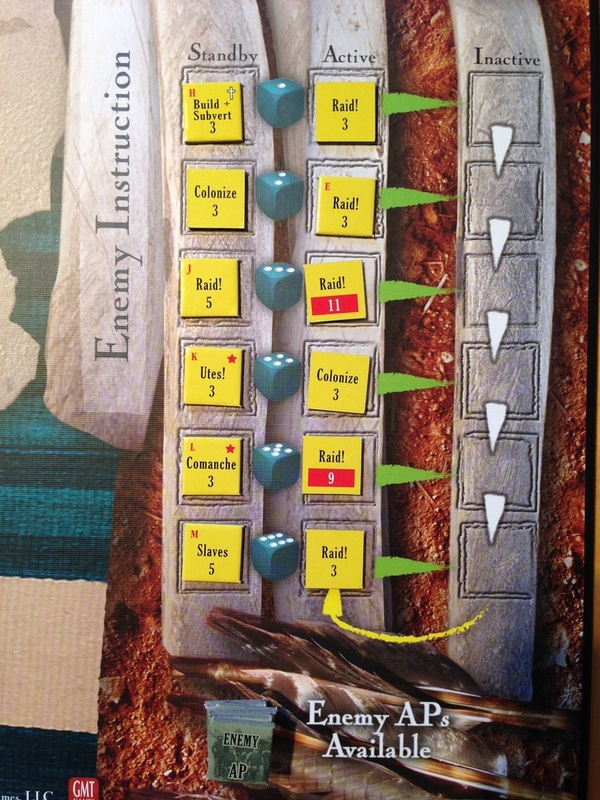 Navajo Wars uses a set of instruction counters, each with a specific action, that are in a column on the side of the board. The idea is that during an enemy turn, you start at the top of the column and the enemy executes as many of these actions as they can. The executed actions are then recirculated to the bottom of the column to eventually come up to haunt you again and again. Because you can see what enemy actions are coming up, you can anticipate and plan accordingly. For the most part, anyway. There is a random factor where the actions can change, or new actions come into play, to keep you on your toes. Also, since these actions are randomized at the beginning of the game, a particular scenario plays differently each time – sometimes quite differently. The game is driven by a set of cards. Each turn a card is revealed and may be one of several types. Some allow the players to execute actions along with some special events, others are just special events, and yet another, which appear periodically, are historical events that relate to what actually happened to the Diné. Like the enemy actions, the cards are randomized at the beginning of each game, with the historical events shuffled in at certain intervals, and that also make the game different each time. In the end, what did I think of the game? I think it’s very good. I can’t say I’ve been a big fan of other solitaire games I’ve tried, they either feel like a puzzle or like I’m just rolling a bunch of dice and am along for the ride. With Navajo Wars, I feel like I’m playing against a real opponent, and a good one. Also, the game is fairly deep. The strategy and the decisions of the player make a big difference to the outcome. As far as randomness is concerned, it’s there, but it’s not oppressive and you can often plan around it. I particularly liked the historical aspect of the game. In the rules, the designer goes into great detail about the historical context of the cards and the rules. As I was playing, I started to understand what the Diné went through and what they were up against. In the end, I’d say if you’re looking for a something that’s different from the usual eurogames and don’t mind some complexity and rules fiddlyness, and don’t mind playing alone, you should give Navajo Wars a try. Author’s Note: If you have a hard time finding the game, you might consider pre-ordering a reprint from GMT Games (see their website, and note it could be a while). An alternative is to check out Comanchería, the sequel to Navajo Wars, which covers the story of the Comanche tribe. Comanchería’s game system is similar to Navajo Wars and the game is purported to be somewhat easier. Comanchería is also newer than Navajo Wars and should be more readily available. I, for one, would heartily welcome more light-medium weight war game reviews. I was a huge fan of Eurogames for two decades — then one day they became stale and lifeless. Well-themed conflict games are now I really care about. And yes, GMT is sublime in this regard. Interesting to hear that you’ve lost the thrill for Eurogames. A similar thing happened to me, but it was focussed mostly on newer Eurogames (too complex, too fiddly, too divorced from their theme). When I do play these days (which is rare), it’s mostly games from the 1995-2000 era and they hold up really well. This game goes completely against what I look for on the OG website. I am considering cancelling my subscription . . . but, man, this game does look interesting! I can’t believe I’m going to seek it out. Thanks for not dismissing it outright (I would have) and putting up a very intriguing review! Thanks for the review, Rick. I have looked at this game before, and never pulled the trigger. But your review inspired me. I have backed the current P500 for the reprint. I work with Navajos and live in New Mexico. I expect to enjpy exploring this game.